Take lemon zest,roasted garlic, butter and 1/2 the bunch of thyme and fill the underside of the chicken skin. This way all your flavours are seeping into your meat. Pat chicken dry with paper towel, rub the chicken all over with a 2tsp of salt, pepper and olive oil. Not only are you further flavouring the chicken, but the chicken skin will be crispier when roasted. 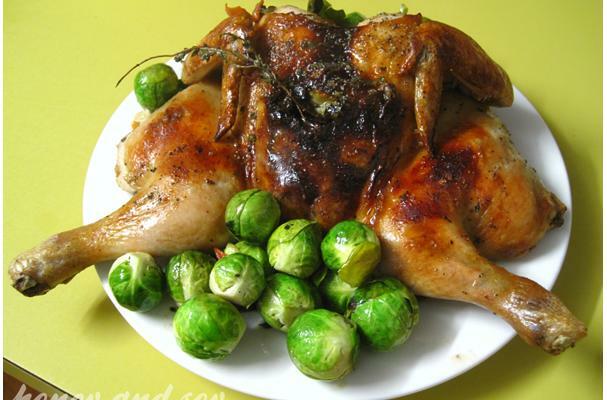 Put chicken on to a roasting pan, pour lemon juice around it. Put lemon skins and remaining thyme underneath the chicken. Roast for 10 minutes on 220°C, then lower the heat to 180 °C and cook for a further 25- 35 mins depending on how large the chicken is. You can check if your chicken is ready by inserting a skewer/ fork into the thickest part ( thigh). If the juices run clear, your chicken is ready. If it’s still is pink, leave it in for a couple more minutes. Take chicken out, keep warm and rest the chicken while you make the sauce.